The poet Charles Baudelaire has written several poems in which the poetic voice or the narrator (of many prose pieces from Paris Spleen) wages a battle with TIME. He wages his fight in the name of Timelessness and intoxication; however, many of those battles ring out with the sound of despair. To be sure, Baudelaire was very pained by the fact that he had to constantly battle with time. And, more importantly, he was all alone in this fight against Time. Delmore Schwartz, no doubt, read Baudelaire. And in many ways, he also struggled with Time. However, he didn’t do it all alone. In his poem “Time’s Dedication,” he calls on “you” the implied reader or some other to join him in this battle. And, unlike Baudelaire, the battle doesn’t end in despair or tragedy. Rather, it has a comic ending which includes a key reference to Charlie Chaplin (who, lest we not forget, Hannah Arendt saw as the last schlemiel of what she calls the ‘hidden tradition’). Schwartz’s comic ending does what Baudelaire can’t: it redeems time by way of taking it away from the trajectory of death and realigns it with what Emmanuel Levinas would call the “time of the other.” And what makes this so novel is that the poem is “time’s dedication” – not his. Time is farewell! Time is farewell! Your blood and beauty: stand with me. Moving together through time to all good. 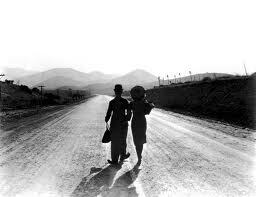 The last stanza suggests that “walking together” like “Chaplin and his orphan sister” – with their odd walk – is a manner of “moving together through time to all good.” Moving toward the good together is something we find in Mendel Mocher Sforim’s The Travels and Adventures of Benjamin III. We also see it in Gimpel the fool who, it seems, is always walking toward the good even though it doesn’t seem to be in sight. These characters, it seems, are not affected by a fatalistic approach to death. They avoid it by way of trusting the other and the good. What I like about Schwartz’s poem is the fact that it is “time’s dedication.” The poem is dedicated to the poet by the time of the other. And it ends with that time rather than dedicating it to the time of the self and death. Most importantly, this dedication is translated into a comedic kind of walking down the road. It isn’t exactly “heroic” in the Heideggarian sense of being-toward-death; rather, it is innocent and naïve.